Could a Five-Star Football Recruit Officially Visit Kentucky? One of the best football prospects in America is no stranger to Kentucky. As his recruitment nears a crescendo, the Cats aren’t going anywhere. Justin Rogers first received interest from UK as a freshman. Steve Clinkscale recruited Oak Park High School in Michigan, eventually receiving a commitment from Rogers’ teammate, Marquan McCall. As the relationship between McCall and Kentucky grew, Rogers blew up. A five-star prospect, Rogers is ranked as high as the No. 10 player overall in the 2020 recruiting class by Rivals. The top-ranked interior offensive lineman in the country, Rogers attended every single national camp for seniors as a junior. He’ll be an Under Armour All-American after his final high school season. Throughout the process Rogers has made the trip from the Detroit area to Lexington quite often. Rogers most recently attended UK Junior Day with his four-star teammate, cornerback Enzo Jennings. As he enters the home stretch, Rogers could return to UK for an official visit. Georgia and Ohio State have been the perceived favorites for quite some time, but Kentucky remains in the mix. Rogers is prioritizing early playing time. Maybe UK is offering the five-star player something other schools cannot? To convince McCall to leave the state of Michigan, Kentucky promised him a spot on the defensive line as a nose guard, where most other schools wanted him to play offensive line. Rogers is considered an offensive lineman first, but he prefers to highlight his defensive expertise. Kentucky would not hesitate to offer Rogers a spot on the defensive side of the ball to lock up the highest-ranked commitment in school history. Friday night provided a wonderful opportunity to take spectacular pictures, like the significant one above, at Kroger Field. Before explaining the portrait’s significance, allow me to briefly explain why the 2019 Blue/White Game was much more than a photoshoot. Mark Stoops’ 2019 spring game accomplished every imaginable goal. The team left the turf injury free. Fans saw the offense unleash points with explosive plays down the field. Terry Wilson dropped bombs and his receivers finished the catch. Some may fear Kentucky’s secondary has been left in shambles by the mass exodus by future pros. Even though that may prove to be true, you cannot discount Wilson’s improvements. He was effortlessly throwing darts. In his first three drives Wilson completed 8-of-8 passes for 169 yards and 2 touchdowns. He had a quarterback rating of 360 and a touchdown at the end of each drive. For those who needed reassurance that Wilson can handle the lofty expectations, he did everything he could possibly do to instill confidence in the fans, coaches and his teammates. Wilson’s timely performance should help Kentucky on the recruiting front. Beau Allen is arguably the most important recruit of the Mark Stoops era. When the Drew Barker experiment did not work, Stoops had to scrape by with JUCO products. Each have produced magnificent results to this point, but Stephen Johnson and Terry Wilson can’t be Beau Allen. The four-star pocket passer is from Lexington. His dad played at Kentucky. He has the potential to be “The Guy” that takes Stoops’ program into the stratosphere, and bring a bunch of his talented friends along with him (like Andru Phillips and John Young). Since Allen’s visit for the game, he’s conducted a couple of interviews, revealing he will finish the recruiting process in a month or so. In each interview he talked about Kentucky’s explosive offense. As Mike Leach and Neal Brown fight for Allen’s services, Eddie Gran’s offensive onslaught might have come at the perfect time. Appearing in the press box for the first time, Adam Luckett was feeling froggy after the Blue/White Game. On top of his grades for the offense and defense, he shared a projected two-deep. I can only disagree with the “or” tag on Keaton Upshaw. 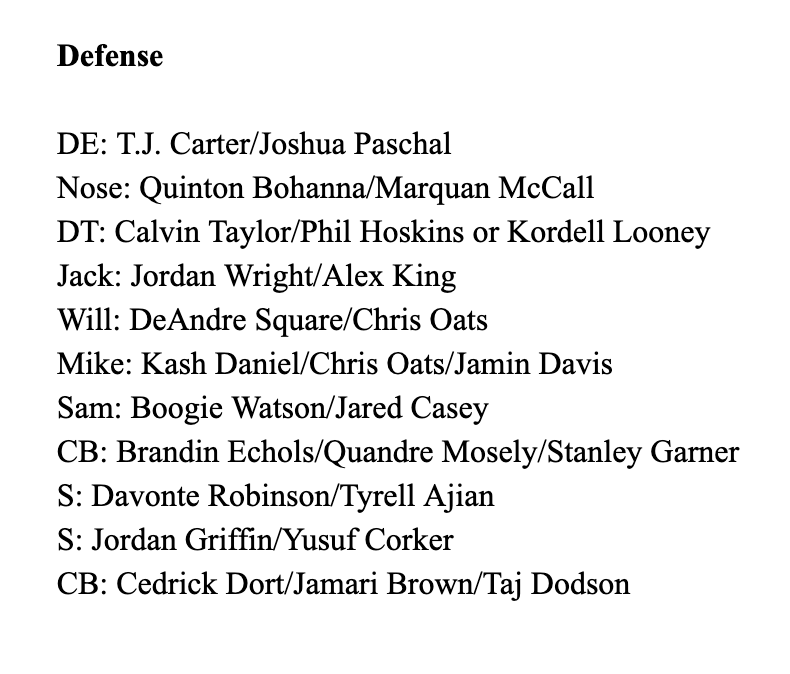 Obviously, much will change, especially in the secondary, prior to August 31, but it’s a good look where everybody stands as of right now. How do recruits spend their time on unofficial visits? Taking pictures and talking Xs and Os. Instead of simply providing a list, here are some of the photos from Friday afternoon. Up first, Randall Cobb. Ever heard of him? His nephew is three-star running back Tee Hodge. Could UK steal another talented athlete from beneath the shadows of Neyland Stadium? Offensive tackle Richie Leonard has received plenty of love from Florida schools recently, but he still remains committed to the Cats. Shortly after snapping these photos, four-star wide receiver Kalil Branham de-committed from Michigan. The power of photography. This is the smirk of a man who has offers from Auburn, Alabama, Georgia and every other powerhouse program. Noah Josey is a rising junior from Brentwood, Tennessee who could be an incredible interior offensive lineman at the next level. Beau Allen’s recruitment is nearing a conclusion. Shortly after watching Eddie Gran’s offense score 74 points in the 2019 Blue/White Game, the four-star quarterback told Rivals’ Justin Rowland he’ll be making his final decision in “around one month.” Before the commitment, Allen will be taking a few official visits. This weekend Allen will travel across the country to Pullman, Washington to officially visit Washington State. After his weekend with Mike Leach, Allen will officially visit UK. The Lexington Catholic quarterback also plans to take an official to West Virginia, the new home of Neal Brown. The other players in Allen’s recruitment are Michigan State, Penn State and Duke. Considered the No. 15 pocket-passer in America by Rivals, Kentucky’s offense does not have the same reputation as Mike Leach or Neal Brown’s air raids. Mark Stoops does have the hometown advantage and Allen’s former head coach, Mark Perry, on staff. Kentucky began recruiting Allen as a freshman. If the Cats finish strong, Stoops could have an early commitment from a game-changer. At least one big-name prospect enjoyed himself at Kentucky’s Spring Game on Friday. In fact, he liked his time in Lexington so much that he decided to re-open his recruitment right after he left. This afternoon, 2020 four-star wide receiver and Kentucky target Kalil Branham decommitted from the University of Michigan. Branham, a 6-foot-1 receiver out of Columbus, OH, is considered the No. 266 prospect overall and the No. 64 receiver in the class of 2020 according to 247 Sports. He currently holds offers from Michigan, Cincinnati, and Boston College, among others. After Branham’s visit to Lexington, Kentucky received three consecutive picks on his Crystal Ball, including one from national recruiting analyst Allen Trieu (91% all-time accuracy). It looks like Branham will be a Wildcat sooner rather than later. When the Cats suit up for tonight’s Blue/White Game, there will be plenty of prospective football players in the stands. Dozens of recruits will be on campus to tour the facilities and catch a first glimpse of Mark Stoops’ 2019 Kentucky Wildcats. Jared Casey, Moses Douglass and Brandin Echols are a few members of the ’19 recruiting class that will be making plays on the field. Those who could not enroll early — like Nik Scalzo, Nik Ognenovic and J.J. Weaver — are expected to be in the stands tonight. The primary focus for Vince Marrow and Co. is on the 2020 recruits. The biggest names on the board are from Kentucky: four-star offensive tackle John Young and four-star quarterback Beau Allen. Offensive tackle commit Richie Leonard will also be in the building, making the long trip from Florida for the game. A couple of athletes from the great state of Ohio will be traveling down I-75 South. Chris Scott from Pickerington, Ohio is a three-star prospect who’s also being recruited by Pitt, Cincinnati and Ohio State. Another Pickerington prospect, defensive tackle Abraham Alabi, will be visiting as well. To round out the top Ohio prospects, Chris Oats’ former Winton Woods teammate, three-star cornerback Miquan Grace, will make the trip to UK. Instead of sticking in Ohio, plenty of the 2020 recruits are visiting from the South. Three-Star cornerback Andru Phillips will be making the trip from Mauldin, South Carolina. 6’5″ 290-pound offensive guard Ta’Chawn Brooks is coming to Lexington from Irmo, South Carolina. Three-star outside linebacker DeMarkus Cunningham hails from Bessemer, Alabama. Aaron Moore from Mufreesboro, Tennessee is ranked as the No. 41 outside linebacker in the country according to Rivals. Many of the visitors on campus today are underclassmen, including some of the best the Bluegrass has to offer. Only a week after Trayveon Longmire received a scholarship offer from Kentucky, the Corbin athlete will return to Lexington for another unofficial visit. Since the rising sophomore’s last visit, Longmire picked up an offer from Scott Satterfield. A pair of rising juniors are considered the Commonwealth’s top two players in their class. Frederick Douglass wide receiver Dekel Crowdus is the No. 1 player in the state, ranked No. 278 overall by 247 Sports. His teammate, offensive guard Jager Burton, is not far behind him at No. 289 overall. Considered one of the ten best at his position right now, multiple college coaches have told me Burton will be in the NFL after three years of college football. When you see how well the 6’4″ 270-pounder moves, you’ll understand why. Terian Williams II starred as a freshman dual-threat quarterback, but he’ll likely end up playing cornerback at the next level. He already holds offers from Tennessee and Kentucky. Rising junior Reid Carrico is an outside linebacker/running back from Ironton, Ohio, ranked No. 193 overall in the 2021 recruiting class. If you thought that was a lengthy list, it is far from complete. Many more will make surprise appearances. We’ll provide a complete recap of the recruiting weekend that was at its conclusion. Plenty of recruits will pack Kroger Field for Friday night’s spring game. The guest list continues to grow. While I wait to finalize it for public consumption, there are a few updates from this week’s visitors that need to be seen. ANOTHER Elite Linemen from the Northeast? Just before Lamar Goods committed to Kentucky, another four-star prospect from the northeast wrapped up an official visit to Kentucky. Hailing from Richland, New Jersey, Chris Mayo is the tenth-ranked offensive guard in 2020 class and the No. 250 player overall according to Rivals. How much of a success was the official visit? Two days later he shrunk his list of finalists to eight. The Cats made the cut alongside Auburn, Minnesota, Arizona State, Purdue, Maryland, West Virginia and Nebraska. Mayo told 247 Sports he left Lexington impressed. He watched his first ever horse race at Keeneland and enjoyed the “homey” atmosphere on campus. The top-ranked player from the Commonwealth in the 2020 class is one of UK’s top priorities. After visiting Alabama two weeks ago, he talked to 247 Sports about his recruitment. He plans on eventually taking official visits to Alabama, Oklahoma and UK. Tisdale opened up about his time with the “greatest coach of all time,” Nick Saban. The Bowling Green native also revealed his family is full of Tennessee fans. His recruitment is far from over. Tisdale said he probably will not make an announcement until the All-American Game in January. Remember the name Torrance Davis. The three-star prospect from Cleveland is a powerful running back that took an unofficial visit to Lexington last weekend. Following the visit, Ohio’s 247 reporter Bill Bank Greene flipped his Crystal Ball pick from Michigan State to UK. Kentucky is recruiting a handful of Ohio running backs this class, but only time will tell which one decided to join the BBN. Prospects have been in and out of the Joe Craft Football Training Facility throughout the spring. Earlier this week a large contingency from South Florida made the trip to Lexington, headlined by three-star St. Thomas Aquinas defensive end Riyad Wilmot. Two weeks ago I wrote in a similar post that a committed Kentucky offensive lineman from Florida was being heavily recruited by Florida schools. Three hours later, Gerald Mincey de-committed. Following the trip to Lexington, he’ll make a stop in Knoxville for Tennessee’s spring game on his way back down I-75. While most can’t understand why a committed player would continue to visit other schools, Leonard gave an eloquent explanation of the recruiting phenomenon that frustrates fans. The interview with Leonard begins around the 34:55 mark, but if you tune in early, you’ll hear Vince Marrow talk about Jared Casey’s recruitment and much more. Earlier today the Big Blue Nation discovered one of the best defensive tackles in America will be a Kentucky Wildcat. Lamar Goods is not like most Kentucky football recruits. Well, not technically, but maybe? Rivals ranks Goods as the No. 13 defensive tackle in the 2020 class and No. 201 player overall. Marquan McCall is the only comparable recruit, slated at No. 194 overall by 247 Sports, however in McCall’s case, every recruiting service considered him an offensive guard. Regardless of pecking order, it’s safe to say Goods is one of the best to ever roll the dice with UK in the trenches. Before moving to Connecticut last fall to finish his high school football career, Goods called Fort McMurray, Canada home. The small oil town in northeast Alberta nicknamed “Fort McMoney” is a 2,205-mile drive away from UK’s campus. As a Canadian footballer, he made the under-18 national team at only 16 years old. Goods had the opportunity to play Team USA in the International Bowl in January of 2018. The defensive lineman picked off a pass to help Canadians demolish the Americans 44-26 at AT&T Stadium in Dallas. That’s exactly how St. Thomas More High head coach Jeff Moore described Goods to the Herald-Leader. I only pray his teammates actually refer to the big Canadian as “Moose.” I will gladly wear a pair of moose antlers to Kroger Field in the fall of 2020. Unfortunately, the Kentucky football record book does not reveal where each letterman is from, making it difficult to discern if a Canadian has ever graced its roster. However, we can safely say he’s the first player from the northeast to commit to Kentucky since Josh Allen. That worked out pretty well for both parties. Unlike the 11th-hour addition of Allen, Kentucky was on Goods early in the recruiting process. He received a scholarship offer from Kentucky before he made the move to the United States. Recruited by Brad White and Derrick LeBlanc, Goods was the No. 1 football player in Canada before transferring to the Connecticut prep school. When you see the 6’4″ 300-pounder move that fast, it’s easy to understand the hype. Kentucky has landed a big fish in the 2020 recruiting class. KSR has confirmed multiple reports that four-star defensive tackle Lamar Goods has committed to Kentucky. Ranked by Rivals as a top 15 interior defensive lineman and the No. 201 player in America, Goods also has offers from Georgia, Florida, Tennessee and many more. The coaching staff is now cashing in on Josh Allen’s success on the recruiting front. Goods is from the same general area as Allen and recruited by his position coach, the current defensive coordinator, Brad White. The northeast is not typical Kentucky football recruiting territory. To land one of the top players at one of the most difficult positions to recruit, there’s no denying White is making a significant impression in the area. Kentucky’s Joe Craft Football Training Facility has been buzzing this spring. In-between training sessions and spring practices with the team, pro prospects have been preparing for the NFL Draft. Meanwhile, the UK coaches have hosted an unprecedented number of recruits. That’s not hyperbole. Following each practice, the media can see players going in and out of the facility. Many are underclassmen from different corners of the state. Earlier this week the Cats offered a scholarship to Corbin rising sophomore Treyveon Longmire. Saturday morning Belfry’s Brett Coleman was on campus to watch the Cats scrimmage at Kroger Field. Coleman was not the top-ranked recruit on campus. Those honors belong to Jutahn McClain. Visiting with his Fairfield High School (Oh.) teammate Dealo McIntosh, 247Sports ranks McClain as a four-star prospect and the No. 6 overall all-purpose back in the 2020 recruiting class. The running back has offers from Michigan, Ohio State, Notre Dame and many others. Kentucky also hosted the seventh-ranked all-purpose back in the country, Elijah Young. The Knoxville native is a four-star recruit with offers from the Cats, Tennessee, Mississippi State, Arkansas and more. Each spring, the Cats have hosted dozens and dozens of recruits for unofficial visits. This is nothing new. But early official visitors are changing the game. The early signing period has pushed up official visits. What used to almost exclusively happen in December or January, last year prospects began to push them up into the summer. This year Stoops is hosting players for officials in the spring. One of the best of the best is in town right now. Four-star offensive guard Chris Mayo is officially visiting UK this weekend. Ranked by Rivals as the No. 250 player in America, Mayo comes from a new recruiting territory: New Jersey. Recruited by defensive coordinator Brad White, Mayo has previously visited Auburn and Rutgers. A top-ten player at his position, you’ll understand why after checking out his highlights. This is just a small sample size. More and more recruits will flood Kentucky’s campus for next Friday’s spring game, including a number of 2019 signees. Kentucky football coaches hosted one of Eastern Kentucky’s brightest young stars for a spring practice visit. The rising sophomore left Lexington with a scholarship offer. As a freshman, running back Treyveon Longmire helped take Corbin to the 3A State Championship game. Longmire caught a 59-yard touchdown pass in the one-point loss to Central at Kroger Field. The home run hitter also scored on special teams and played defense for the Redhounds. Before receiving the offer from Kentucky, Longmire spent time with Terry Wilson and the Cats’ biggest playmaker, Lynn Bowden. Kentucky is just the second school to extend a scholarship offer to Longmire. Western Michigan first made a move in early March. The Cats are making Corbin’s future superstar an early priority. A month and a half after committing to Kentucky, three-star Florida offensive tackle Gerald Mincey has backed off of his pledge. In a tweet released this evening, the 2020 prospect announced that while Kentucky is still on his list, he will be opening his recruitment back up. The 6-foot-6, 315-pound tackle out of Ft. Lauderdale is considered the No. 96 offensive tackle in the class of 2020. Mincey committed to Kentucky over Arizona, UCF, WKU and FIU, among others. A Cardinal Gibbons High School product, Mincey was the second Florida offensive lineman commitment for next year’s class, with the other being three-star Cocoa offensive tackle Richie Leonard. Now, Leonard remains as Kentucky’s lone commitment in the class of 2020. As spring football heats up, more and more recruits are visiting Kentucky’s campus. Tuesday morning the Cats had company from Ohio. Three-star Cincinnati running back Miyan Williams made the trip down I-75 to watch spring practice and see UK’s facilities. A powerful 2020 running back that also holds an offer from Michigan, Williams attends Winton Woods High School, Mike Edwards and Chris Oats’ alma mater. In one playoff game last fall, Williams rushed for 430 yards and six touchdowns to lead his team to a come-from-behind victory. Williams was not the only recruit on campus this week. Jonesborough, Tennessee athlete Prince Kollie was one of a few underclassmen that saw the facility. About a dozen or so underclassmen have announced offers since UK hosted a slew of recruits for the first spring scrimmage last Saturday. All of them received an added bonus on their visits last week with the departing senior class still in town for UK Pro Day. At each spring practice you’ll find at least a handful of recruits on the sidelines. The spring tour season also applies to UK targets visiting elsewhere. One of UK’s other top running back targets is Michael Drennen. While Williams brings the power, this Ohio running back excels in space. The rising senior from Dublin Coffman can run out of the backfield or catch passes out of the slot. This week the four-star recruit picked up offers from Ole Miss, Florida and Alabama, making life difficult for the Cats. One of Kentucky’s early commits in the 2020 class is catching the eye of all the big dogs. Between March 16-26, offensive tackle Gerald Mincey received offers from Florida’s big three: Florida State, Miami and Florida. A teammate of Nik Scalzo at Cardinal Gibbons in Ft. Lauderdale, things change for Florida kids when the big dogs get involved. It’s never good to see the top-ranked player in the Commonwealth hanging out with Nick Saban. I wouldn’t leave you with bad news. One of the best players in America, Justin Rogers, is rocking UK swag to school. That’s good for something, right? How about a Yahtzee to get the morning rolling? 2020 three-star athlete Jim Davis just committed to Kentucky. The Belle Glade, Florida native also had an offer from Syracuse. 247 Sports ranks Davis the 172nd best wide receiver in the country. Nick Roush will be by with more on him in just a bit. After I VISIT Kentucky In April I’ll repost My Commitment ?????? One of UK’s top recruits in the 2018 recruiting class is looking for a new home. L’Christian “Blue” Smith initially picked to attend Ohio State over Kentucky. After one redshirt season in Columbus, the former four-star prospect is reportedly set to transfer at the end of the spring semester. A 6’6″ outside receiver, Rivals ranked him as America’s No. 39 overall player in the 2018 recruiting class. Hailing from Wayne High School in Dayton, Ohio, the Cats currently have another 6’6″ wide receiver from Wayne on the roster, Ahmad Wagner. The two helped lead Wayne to the Ohio Division I state championship game in 2015, the state’s largest class for high school football. 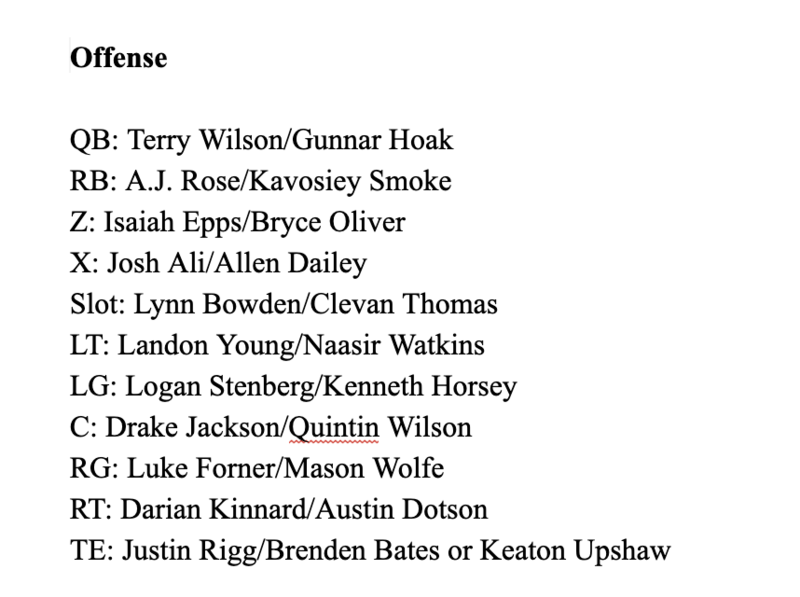 Kentucky lost a few players off the roster and did not sign a complete recruiting class in February, leaving a few scholarships available for additions at the end of the spring semester. Most believed UK would hit the grad transfer market to find a wide receiver or two. Now the Cats have another incredibly talented option, Blue Smith.